During our second day visiting the Freda Diesing school, the topic of ‘Kitselas Canyon’ kept emerging. I wondered about what this place was, why it was so important, if and when I would understand more about the uniqueness that this place seemed to hold for not only the artists – learners and teachers – at the school, but also for many First nations communities beyond. 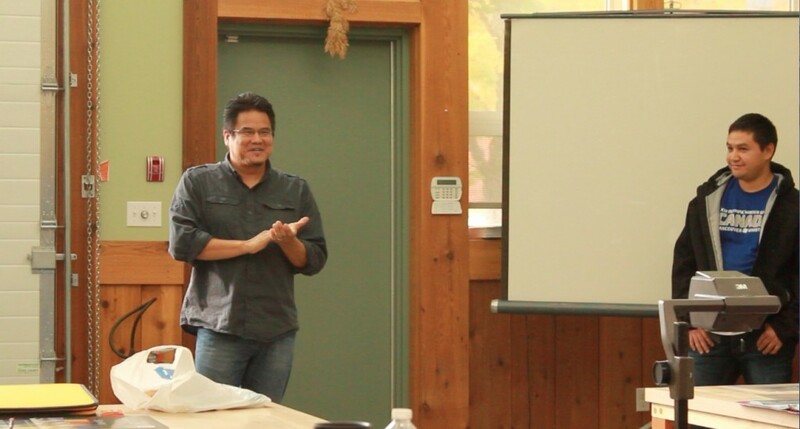 Dean Heron (current teacher and former student) and Latham Mack (former student and apprentice artist of Dempsey Bob — see ‘voices of former students’ post for more information) each spoke about the importance of their experiences working on the painting of longhouses and carving of totem poles at Kitselas Canyon. Closer to the end of the day, Rocque, Ken and Stan spoke about Kitselas Canyon, providing a brief historical overview of the place, stories about what happened as part of European conquest and colonization and what was being done now as part of a long-term cultural reclamation project at Kitselas Canyon that each of them (Dempsey, Ken and Stan) and students were deeply involved in, as well as people from Gitsxan communities. Totems poles are stories. The most important figure on the totem pole is on the bottom rather than the top. This was significant to me as I was reminded of the oft used phrase – ‘low man on the totem pole’ — who would according to the design and carving of stories embedded within a totem pole – be the most revered! This particular totem pole is really impressive, the more you look at it, the more you see. The details are exquisite. Dempsey, Stan, Ken, Dean and Latham were all involved in the carving of this pole. The community pole was the first one to be raised in over 150 years and there was a community ceremony of dancing and singing before it was raised. The main motivation of this ceremony was so that the community felt it belonged to them, in spite of the fact that multiple people, from multiple First Nations communities, aside from the Gitsxan, were involved in its design and carving. After we marveled at and learned more about the community totem pole, Dempsey directed us down to the Kitselas Canyon, a short 5 –minute drive down a hill. We met Brian, Stan’s cousin at the entrance to Kitselas Canyon. 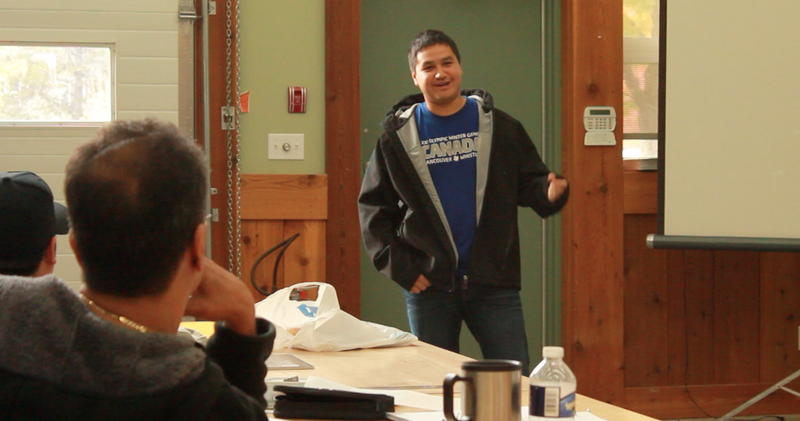 Brian spoke to us of the importance of this place to him personally as a renewing of their culture and community. 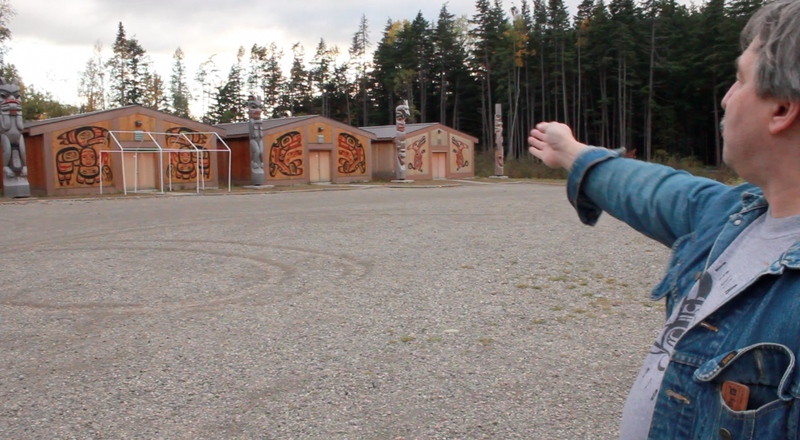 In front of us were 4 longhouses and 5 totem poles – each one placed on one side of a longhouse. Another longhouse and totem pole were on the right side of the 4 longhouses. Rocque had explained during that afternoon in a photographic presentation to all of the students about the tragic history of the area. 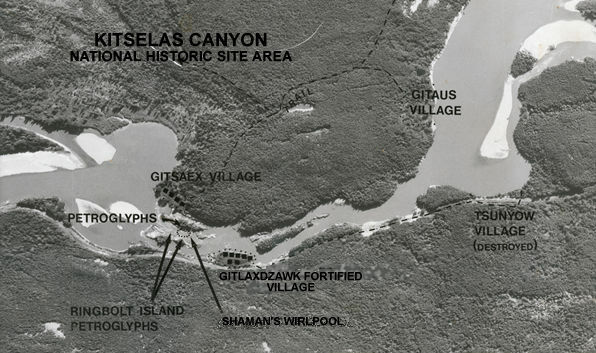 Using maps and old photographs we learned that Gitsaex Village was between 5,000 to 6,000 years old. The last people to leave the village was in 1912 and we saw them, in an old photo from that time, dressed in their Sunday best, rather than clothing they might have worn before European contact. 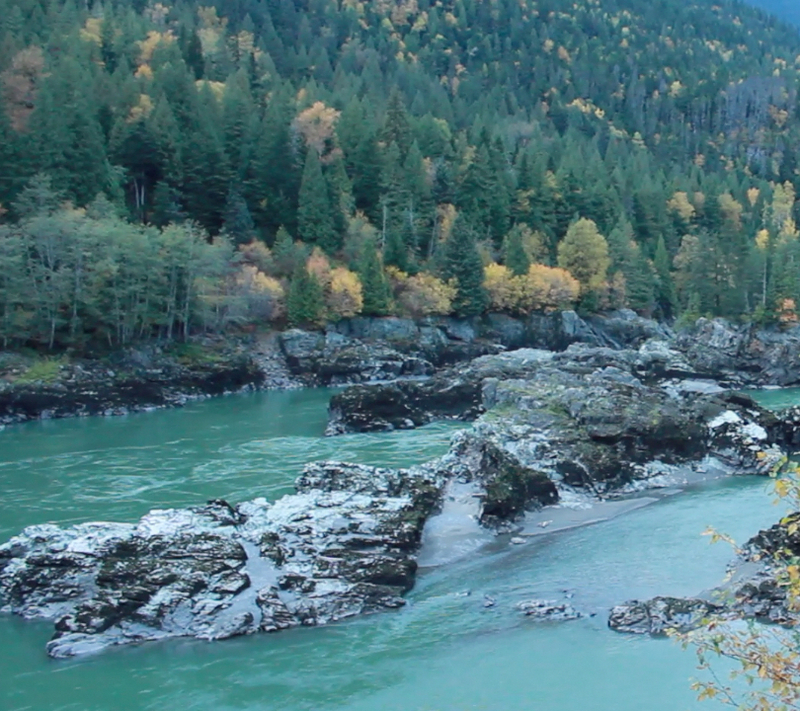 Where the new longhouses and totem poles were being built at the current Kitselas Canyon National Historic Site, was about a mile or so above the Skeena river. 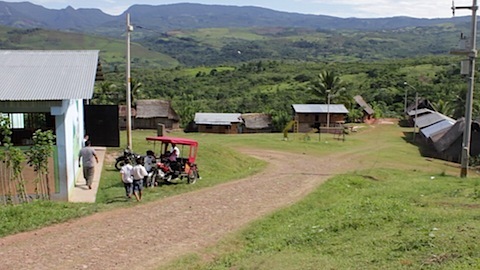 The reason for the new construction being at this higher site was that the area next to the river, the site of the original village, were now gravesites where nearly the entire village died due to Smallpox. Families who had perished were left as they were in their longhouses to prevent further spread of the disease. There were also many fallen totem poles amidst the gravesites. The last totem pole fell down in that area in 2001 and is now nearly impossible to discern from the fauna that has grown around and through it, decaying it beyond recognition. 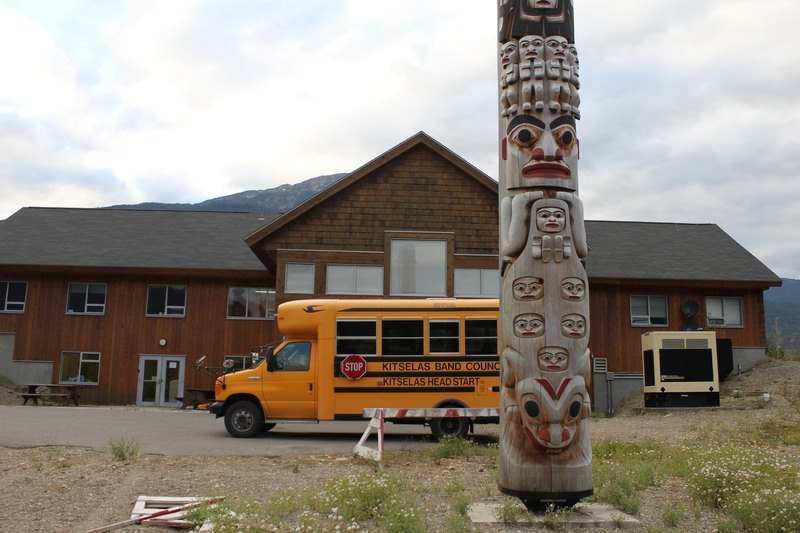 The construction of the longhouses and the totem poles involved a multitude of people, the majority of which work or learn at the Freda Diesing school. 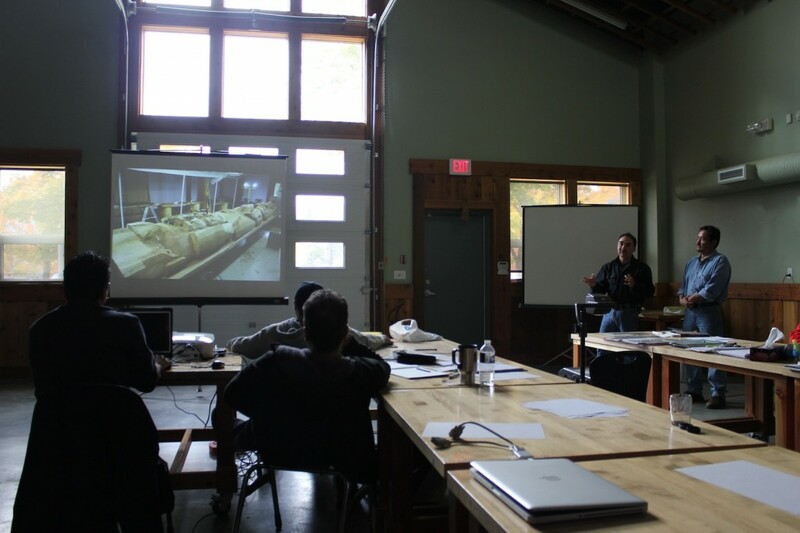 Dempsey, Ken and Stan designed the longhouse fronts and the totem poles in a 13 week project. 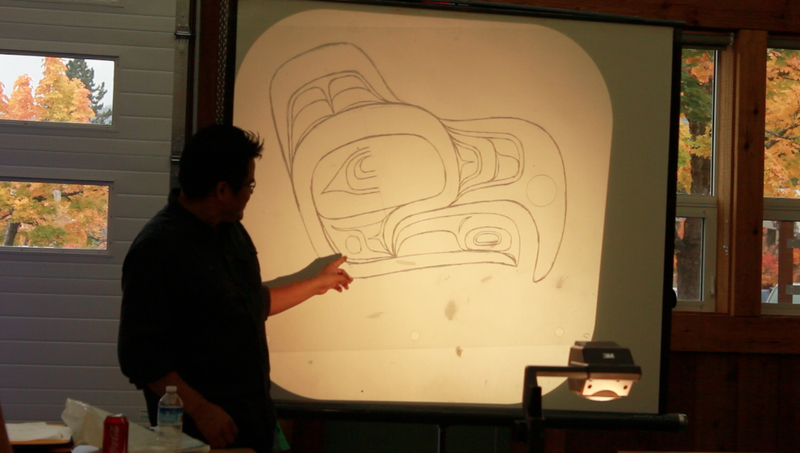 Dean described how the students were responsible for sketching out the designs using projectors and painting the designs onto the longhouse fronts using the original drawings by Dempsey, Stan and Ken. Dean told us how they worked on their hands and knees those 13 weeks – all of the painting had to be done on the floor as painting vertically was much more difficult. He said that this was a tremendous opportunity for them as students, to be so closely involved in such a significant cultural reclamation project. Ken described the project as ‘an artist’s dream’ to bring out their culture and that the project had been excellent overall. The longhouses all began in 2007 (although the project had been discussed for at least 25 years) and are now used as a museum; a gathering space for ceremonies or weddings; a studio space and a shop for selling objects. 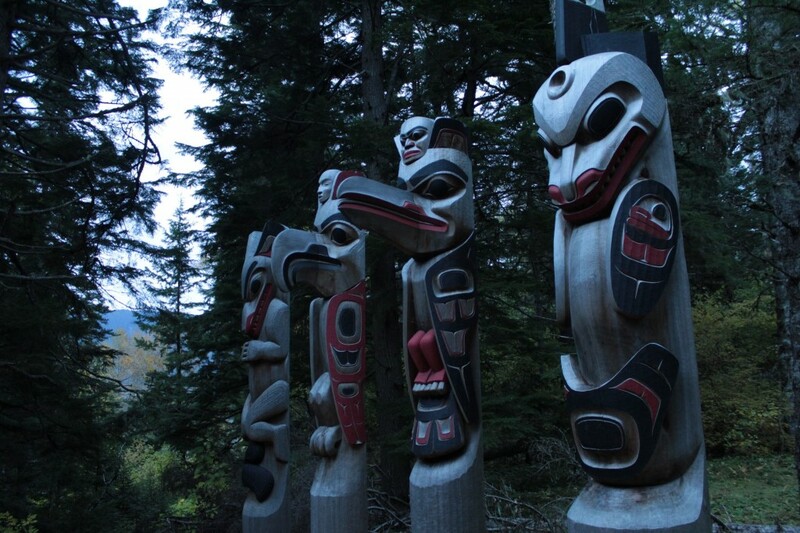 The totem poles next to the longhouses represent 4 different clan crests – wolf, bear, raven and beaver. There is also a salmon totem. Similar to the community totem pole, there was a ceremony and Elders came to bless the longhouses and totem poles once they were built and raised. After viewing and learning about the longhouses and totem poles, Dempsey said that we should hurry through the forest before dark. The walk through the forest down to view the river was about twenty minutes. 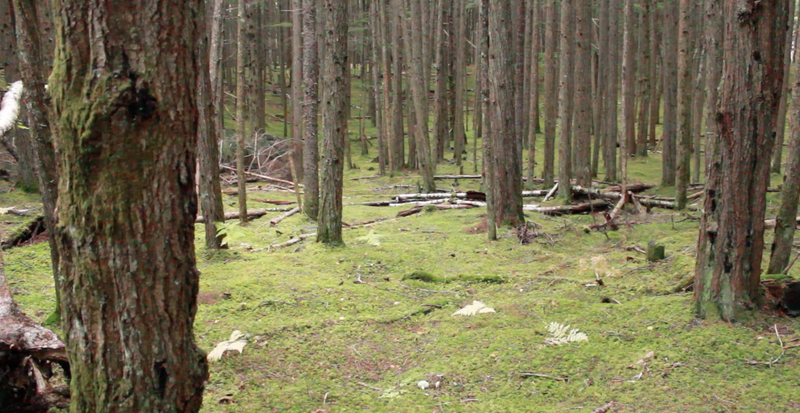 The forest was carpeted in moss with glowing shades of green. There was still a good deal of light on the way down. Stands of evergreen trees emerged sharply, perpendicular from the bright green moss. The trees are second growth (possibly third) and are about a meter in diameter. There are odd areas that are sunken in and it is difficult to perceive why and how these were formed as the moss disguises well. We suddenly came upon four totem poles, formed in a line, all facing toward the river. Stan, Brian and Ken had designed and carved the totem poles. One is of a Raven and is a replica of a fallen totem. Brian told us that participating in the design and carving of these totem poles for Kitselas Canyon had pulled him out of a deep depression that had taken over him after the death of a family member due to suicide. We had learned (previously through conversations we had with Blackfoot community members) that this happens often within First Nations communities. I was moved by Brian’s openness and could feel his emotional connection with the carved beings that were now storied into the landscape at Kitselas Canyon – providing a renewal of wisdom and watchfulness. The color of the totem poles had become a silvery color due to weather and aging. 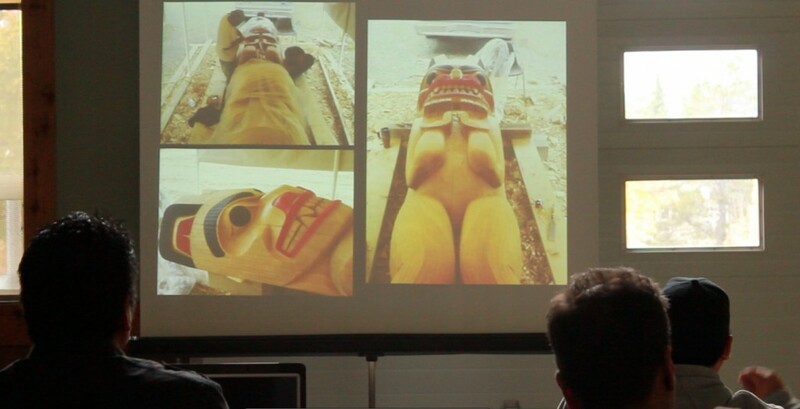 Brian spoke of a calm that has ensued since the totems were raised – within the community and within the forest. Udi and I both felt a sense that these totems belonged to the place, that a gentle eye was keeping watch on the beings that have lived and continue to live in this place. 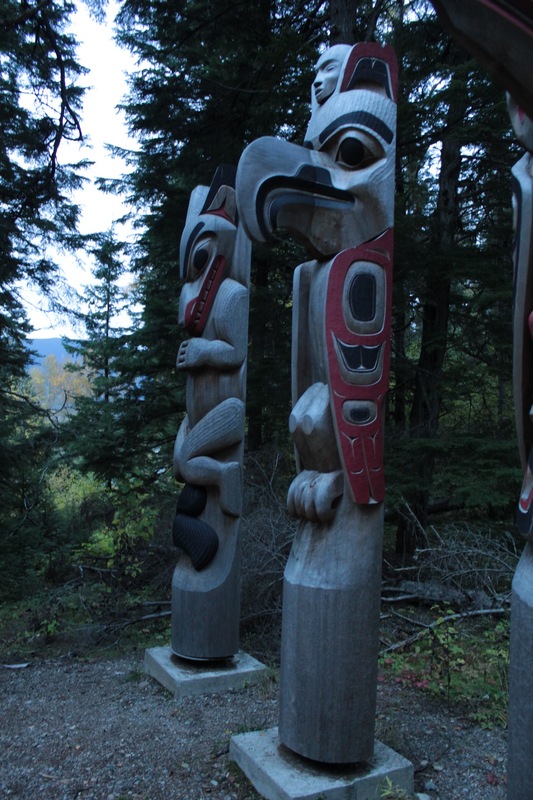 The light of the last rays of that day’s sun created an intensity of strength emanating from these beings watching over the gravesites in the ancient village, the fallen totem poles and the Skeena river. 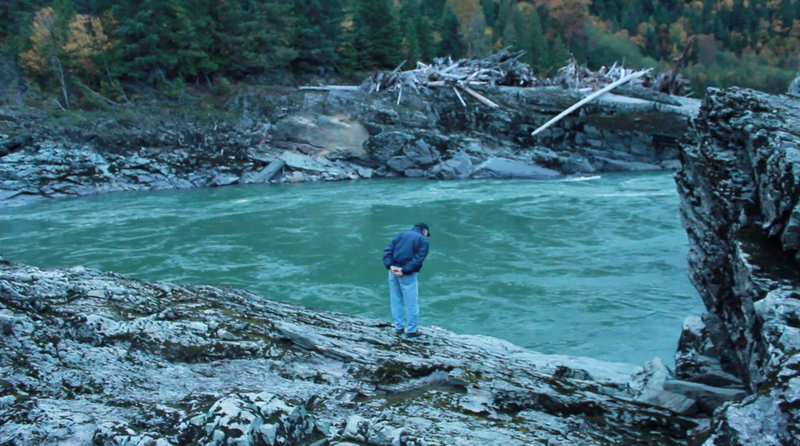 The Skeena River is deceptively dangerous. The current is wild and dangerous. There are upswells and a place in the middle is known as the ‘shaman’s whirlpool’ which has taken people and canoes under on many occasions. 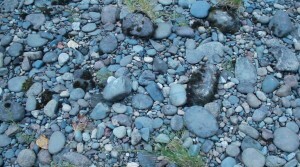 The river is a turquoise color, the rocks covered with shades of lichens (blacks, greens, yellows). 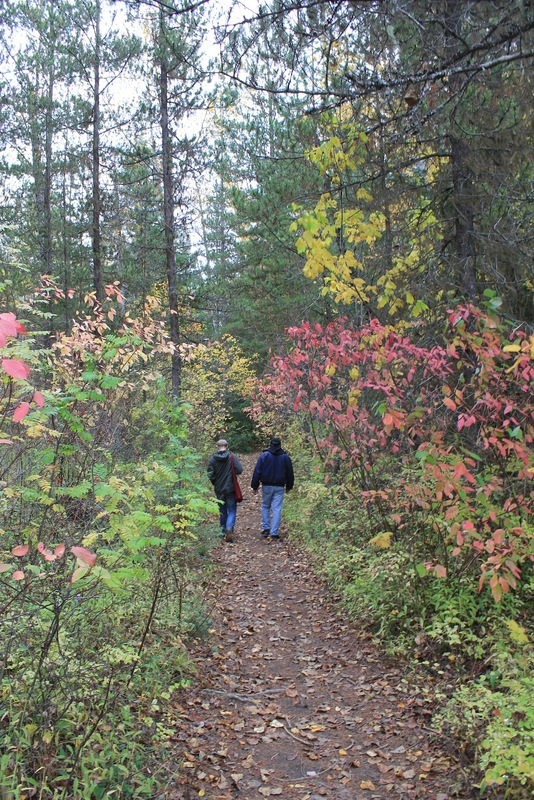 Beyond the river, mountains raise and there are evergreen trees and aspens yellowing in the decreasing Autumn daylight hours. On the other side of the river, the train runs straight through where the Gitsxan once had their fortress – a large longhouse to which villagers would escape to during times of siege. Brian and Dempsey decided to take us all the way down to the river’s edge. We had to walk through brush and on a muddy path. There was an eerie feeling here and we were told half-way down that we were in the middle of the old village, the longhouses and gravesites and that old totem poles were decomposing amidst the vines and brush. 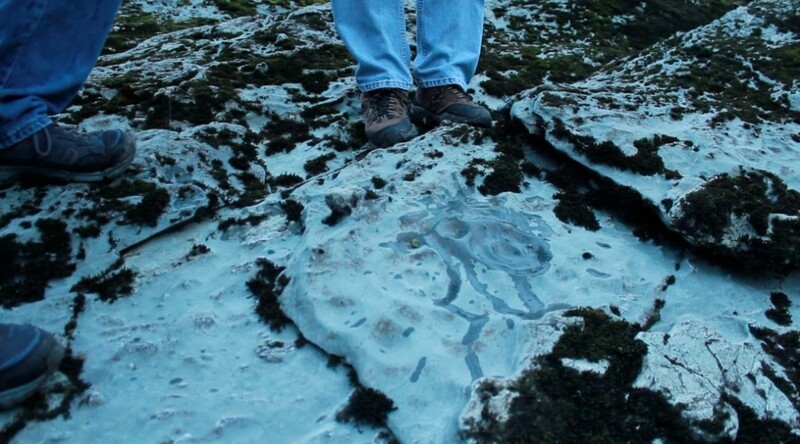 We walked slowly on the small rocks along the river’s edge and then towards the larger rocks where Dempsey found a petroglyph and poured some water on it so that we could see it more closely. On the rocks next to and on the river, there are highly intricate petroglyphs of spirit beings (this is obvious as the beings look like they are being x-rayed, you can see their bones) amongst other animal forms and symbols. There is still a great deal of speculation as to what these mean. After walking, observing, feeling, breathing it was time to leave. There was barely any light left. Dempsey handed us a perfectly round stone as we begun to walk back up through the brush. We thanked him for the beautiful stone and he said that it was not him that we should thank. 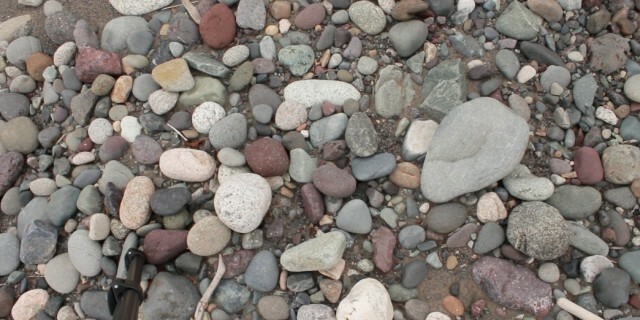 He had asked Brian’s permission for us to be given the stone because afterall, it was a stone that was not from his territory, but rather from that of Brian’s. Dempsey could not have given us the stone without either putting another one in its place or without permission from a community member of that First Nations territory. It was then we really began to further understand this notion of reciprocity and how it is practiced. Walking through the forest out of the canyon, it was nearly dark. I kept thinking I saw shadows of different animals. Brian told us stories of playing in these woods as a boy and encountering bears and wolves. The longhouses were striking under the dim lights as we emerged from the forest. 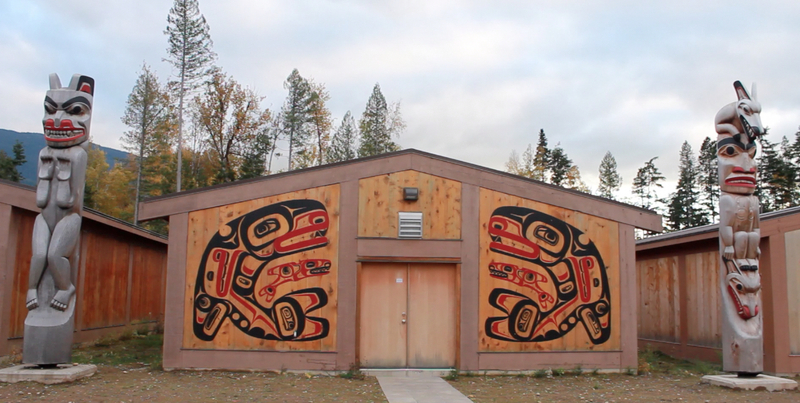 I felt I understood more about the importance of these reconstructed longhouses, the cultural connections for artists such as Stan, Dempsey, Brian and Ken – and for the students to have the opportunity to engage so intimately with repatriating space and culture through their art. There was a strong sense of healing in this place – for Brian, for the forest, the river and the ancestors. 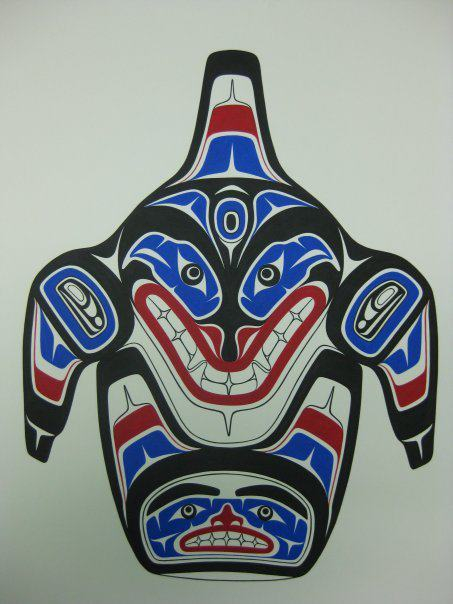 I was also un derstanding more about the stories and symbols represented in totem poles and designs. 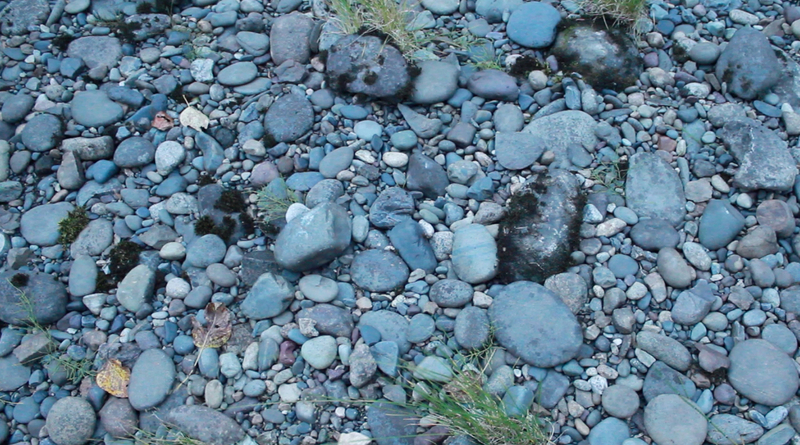 Like Udi, I was starting to see ovoid shapes and animals within the rocks and the forests. I could only imagine what it must be like for these artists to live in such a wondrous storied landscape with the stories echoing through the ages. Two former students – Dean Heron and Latham Mack – each gave a talk to all current students while we were there about their experiences as students. This posting summarizes the stories provided by Dean and Latham. 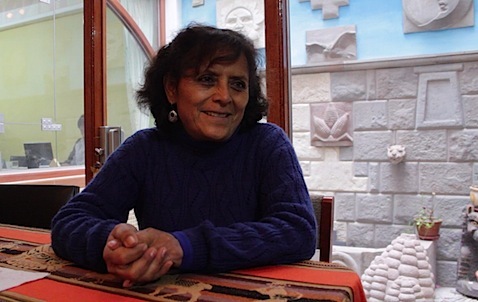 These talks were recorded (filmed) as part of the second day visiting the Freda Diesing school. The full versions of this footage will be sent to the school for their own use and sections of it will be integrated into a shorter film we will be editing on our experiences at the school while other sections will be integrated into a longer full-length documentary that will be representing the places we have visited and will be visited during the course of this year. The learners and teachers at the school were each inspiring in their own way. I learned a huge amount about the power of art, particularly within a context that provides such a warm and disciplined environment that the Freda Diesing school nurtures. 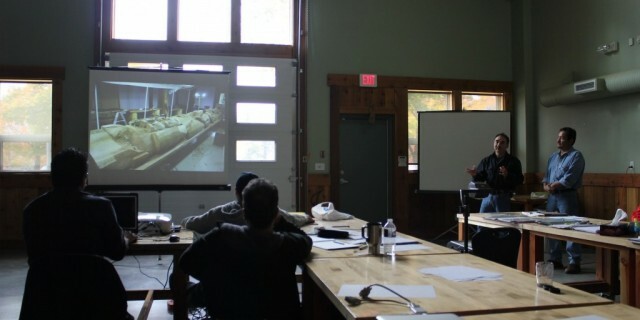 Photo taken by Udi of Dean Heron teaching the first-year students about ovoids as shown in a drawing of an eagle. All students have to draw an ovoid repetitively each day to learn the skills and techniques of drawing this essential component of Northern First Nations art. The first person to speak was Dean Heron. 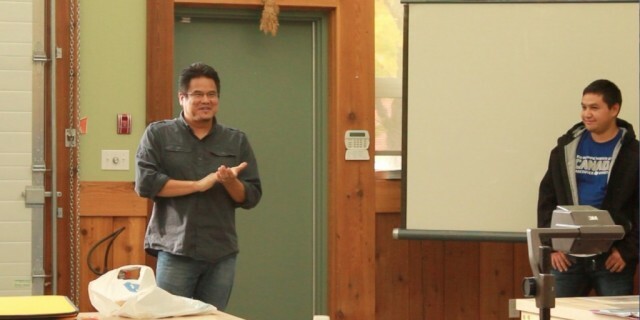 Dean is currently a teacher at the Freda Diesing school and is actively involved in the development of his own art (which we saw in the longhouse on campus, in the designs on the longhouses at Kitselas Canyon and also in some of his carved objects selling at the Spirit Gallery in Vancouver). Photo taken by Udi of Dean Heron inside the campus longhouse. Dean helped to paint the design behind him. Dean didn’t grow up in a First Nations cultural community – he grew up in a White family. His adoptive parents always had encouraged him to connect with his culture which is Kaska/Tlinglit in the Yukon Territory. He studied anthropology and political science down in Victoria which is where he met his wife. She clearly has had a tremendous influence as to where he is now and he spoke of her with a deep appreciation, tenderness and love. Dean told us how his wife would always push him to learn more about what his heritage meant. He admitted that when he met her he “didn’t know anything about his culture”. His parents had bought him lots of books as a kid growing up, but he said that he did not really spend much time learning about his ancestral heritage. He told us that after he was first married and money was low, that his wife urged him to create paintings that could be given as gifts rather than buying things. He told us how he found that idea as a joke, that he did not feel that he had any talent artistically. However, through his wife’s encouragement, he taught himself how to paint through a book – painting by doing. He surprised himself by his interests in learning more and that he was not as bad as previously thought. He began looking more into First Nations art on his own. Eventually he found that he wanted to study Northern art – but, that it is very difficult to study Northern art in the ‘South’ down in Victoria. One day he happened to go into a gallery in Victoria and saw carvings by Ken McNeil and Stan Bevan (two of the founders of the Freda Diesing school). He was in awe – their work, to him, captured the essence of art. At an event he met Dempsey Bob very briefly and they met again, by chance, at a house party event in Victoria (at one of Dempsey’s children). He was invited by Dempsey to an event in Vancouver – and was then invited to come up to study at Freda Diesing for their first inaugural year as a school. As an artist, Dean felt he needed much more guidance and mentoring to understand the “old art” – to understand the nuances of what he was looking at. The school helped break it down to the fundamentals. It changed his life completely. 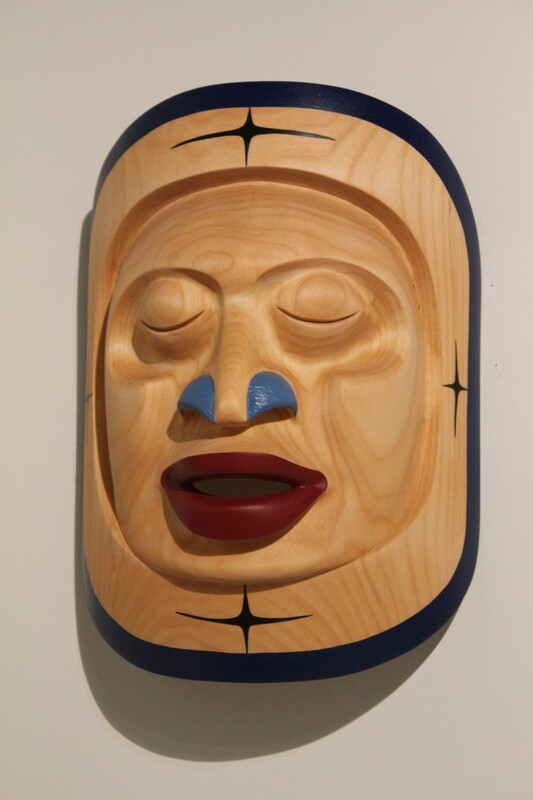 He worked in Kitselas Canyon at the end of his first year – drawing, painting and carving. He created a sculpture for the 2010 Olympics that was exhibited in Vancouver. During the Olympics he ended up finding some of this relatives up in the Yukon territory. He spoke passionately how art came full circle for him – he started doing it to understand more about where he was from. It helped then to bring him back to his roots and since 2010 he has been up to the Yukon several times to meet and get to know his relatives. He was also told right from the beginning of the first year of the importance to teach as an artist. He started teaching immediately. Teaching up in the Yukon – especially with young kids which he told us he has learned alot from, especially a particular 5-year old about drawing salmon! Dean spoke for nearly 20 minutes with a tremendous passion and openness that was captivating. Everyone in the room was very moved. Latham Mack spoke after Dean for about 10 minutes. A recent graduate from the Freda Deising school, Latham grew up in Bellacoola within his own Nuxalk community. He told us that different to Dean, he learned his culture from a young age – through school. His school is run completely by his First Nations Nuxalk community. He told us that he participated in Potlatches from when he was young. He first started carving with his uncle. Latham told us that he used to just watch them carve – for many years. Then one day, his uncle said, “You are here every day, you might as well start carving”. In grade 10 he told us that a non-native guy came back and he tried to get some totem poles going. This particular non-native guy started teaching art and Latham took the course. Latham carved a raven which he thought was good but his grandfather didn’t like that a non-native was teaching him. So then his grandfather taught him and Latham carved under him. In 2008, he applied to study at Freda Diesing and was accepted as a student. He told us that had he not been accepted into the program, he would have worked in the diamond mines which many young people go to work in because of difficulties in locating work and the decent pay that such work offers. Latham told us that the school opened up many doors for him – he had his work displayed at the Vancouver airport in 2009/2010 (by winning the scholarship twice for his work to be displayed). He is currently an apprentice of Dempsey, who mentors him. 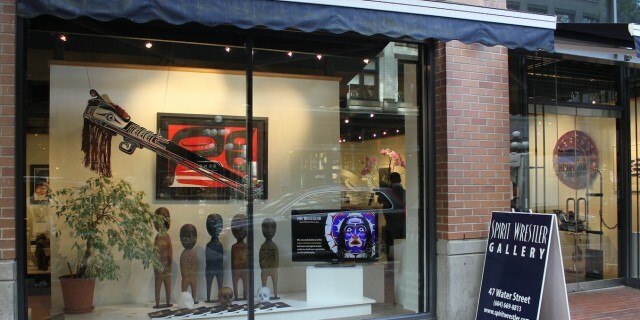 Latham’s work is also on display at the museum at Vancouver. He was also able to participation in work in Kitselas Canyon with Dean and other students. Latham has travelled to New Zealand to give carving workshops to Maori artists. Latham told us that now he can look at any design and understand the shapes and the forms. 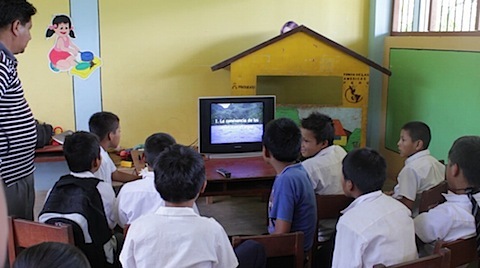 Before he did not understand these – the school helped him to learn this. Udi and I bought one of Latham’s prints – of a killer whale. The colours, style and presentation of the print are stunning. It is his first print that he is selling publicly. When I made the documentary ‘Everything was Carved’ with some members of the Haida Nation during their visit to the Pitt Rivers museum, I came to learn and appreciate the complex relationship between museums and what in this field are called ‘source communities’. 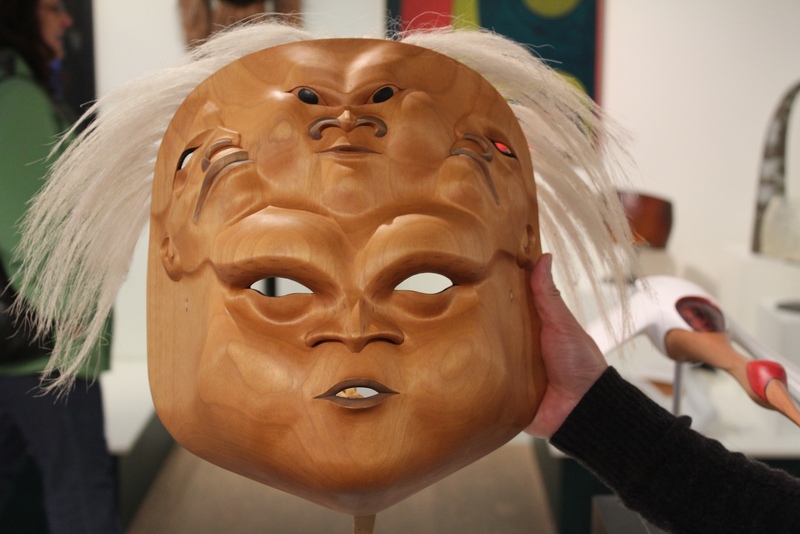 Whilst the Haida expressed their wish to have their objects back (although the attribution of who made what and what belongs to whom is not always straightforward), they were also aware that museums had helped to increase the fame of their Nation. 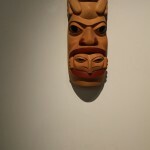 Haida objects, like those of other Nations in the Pacific Northwest, have come to be collected by countless museums and private collections across the world since the arrival of Europeans in the Americas. This has meant that the art of this region, albeit having different styles to the more trained eye, is quickly recognisable and known the world over. 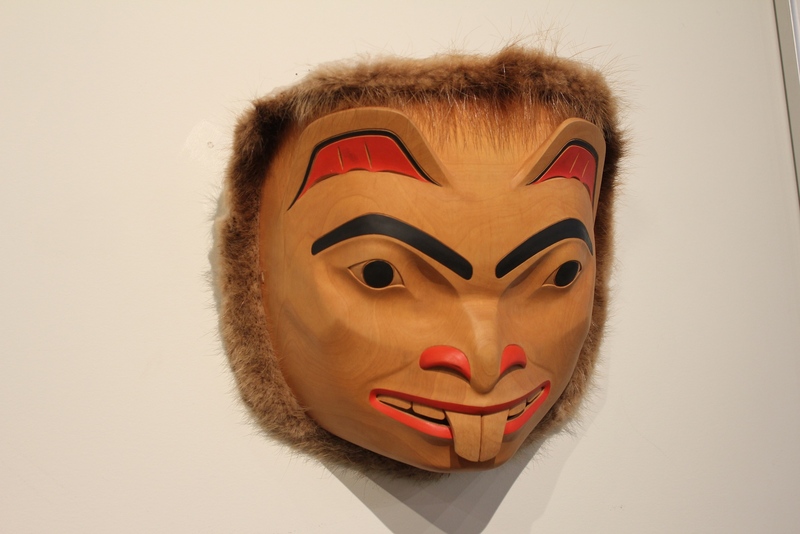 Northwest coast art has become a highly prized collectible for museums and the international art market. A visit to downtown Vancouver by the water front is a good demonstration of the value the art of the Northwest coast has acquired. This upscale neighbourhood is lined with galleries and boutiques attracting tourists and art buyers. 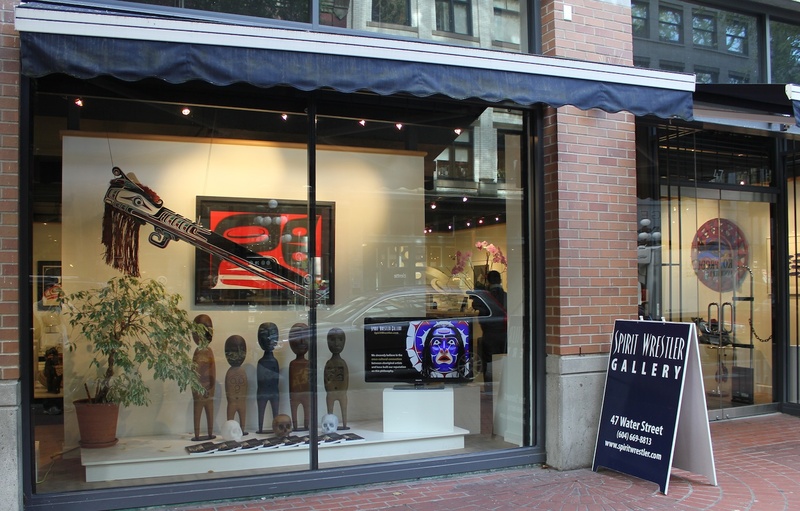 As Rocque conveyed to us, the art of the Northwest coast is the most valuable in the indigenous fine art world with the market worth an estimated one billion dollars a year. This high demand for the art of this region has meant that opportunities and financial rewards have been achieved by some talented artists. We saw a number of pieces from such artists at the Spirit Wrestler Gallery where we were shown around by a gallery worker whose love for the art of this region was evident as he showed us some of his favourite pieces. 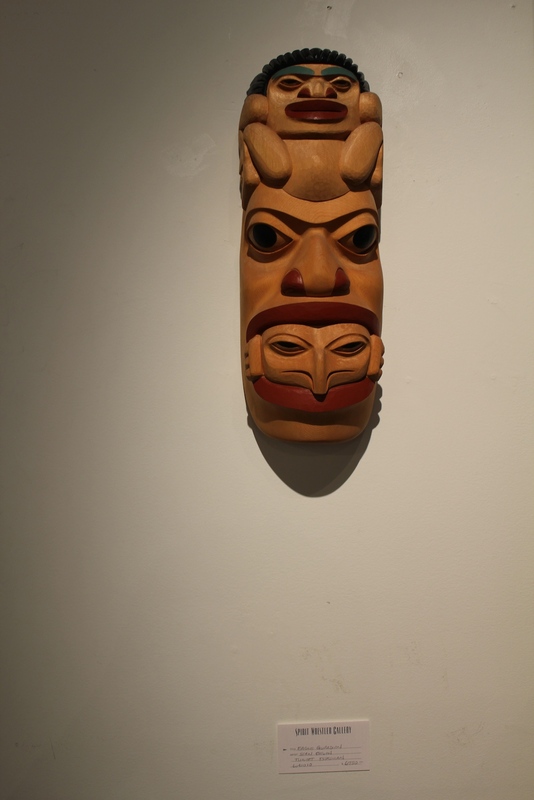 Here we saw intricately beautiful sculptures and masks made by instructors and former students from the Freda Diesing School, alongside the work of other famous Northwest coast artists. Some of these pieces were selling for thousands of dollars and the works of desirable artists did not stay long in the Gallery before being bought up. The Spirit Wrestler Gallery has a close connection to the School, with the director of the Gallery lecturing there once a year and the students having their degree show at the Gallery. As the gallery worker explained to us, the degree show is a big deal for students and their families who come all the way down to Vancouver from northern B.C. After graduating, a number of students carry on trying to make it as artists. Some obtain commissions or win competitions and manage to make a living. 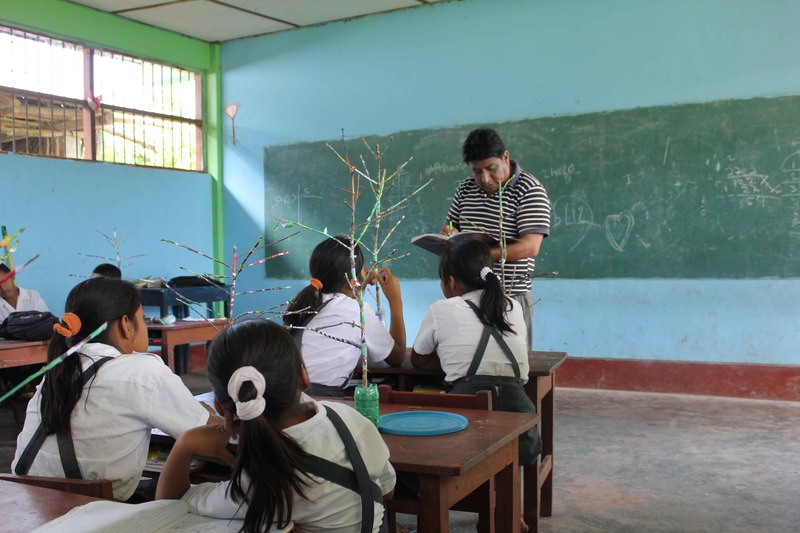 Others have gone back to their communities and become art teachers or taken on other professions. 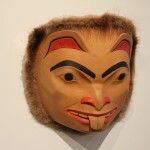 Some former students have stayed on in Terrace and stared, according to Dempsey, a Northwest coast art scene in town. If they do manage to break into the fine art market how these artists will negotiate the two worlds of art they live in, that of art as a part of a living culture and that of art as a set of objects for contemplation and highly valued commodities, remains to be seen. The instructors at the School, Dempsey, Ken, Stan and Ken seem to have found some kind of balance on this matter and their concern for their art and their communities is clearly seen in their work as teachers. 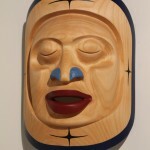 Institutions like the Museum of Anthropology in Vancouver have also managed to find some accommodation between the world of objects as part of a museum and the world of objects as part of a living culture. What is interesting in both of these cases is to see how the same object, whether a mask, sculpture or totem pole, can have such different meanings and values and serve different functions depending on the set of institutions and cultural practices that surround it. An endnote that would take a great deal of work and further research to understand and give full justice to, but which is important to say anyway. 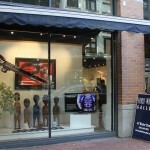 The world of First Nations art, of billion dollar art markets, of beautifully made objects of interactive museums lives within a broader context of the continuing problems faced by First Nations communities in terms of poverty, the break up of families and communities, violence and drugs, unemployment and health issues. As was pointed out to us by different people, the gallery zone in downtown Vancouver is next to what is supposed to be the poorest neighbourhood in the whole of Canada and one where many First Nations peoples live – which lies just a few blocks to the east. I grew up with art, it was just something I did and enjoyed since childhood. Painting, drawing, making things out of clay and other materials had always been pleasurable, absorbing and unpretentious activities for me. I also loved looking at art books and going to see art in museums, whenever my parents took me. This all changed after I got to art college. What had until then been a spontaneous, creative and hopeful activity in which I could lose myself for hours now took place in an environment filled with anxiety, insecurity and competitiveness. Much of the contemporary art I saw celebrated around me, in magazines and galleries seemed shallow, market-driven and uninteresting. Rather than a gratifying and intuitive activity I felt a lot of art to be anecdotal, full of artifice and self-indulgent. I searched through the history and sociology of art for reasons of why this had come to be, writing my masters thesis on the emergence of the cult of the artist and the contemporary institutions of aesthetic contemplation (museums, galleries and so on). I was curious of how the idea and practice of the ‘art object’, as that which is removed from the flow of day to day life and social activity to become its own separate domain, had been achieved. I did not have the language then, nor the experiences or the readings, to appreciate and describe the role of art in different cultures. I could not see then how good, or great, art is grounded in place, in the people and culture, in history, and how it is nourished by these ingredients. This is one of the important things I learnt whilst in Terrace and especially in conversations with Dempsey. 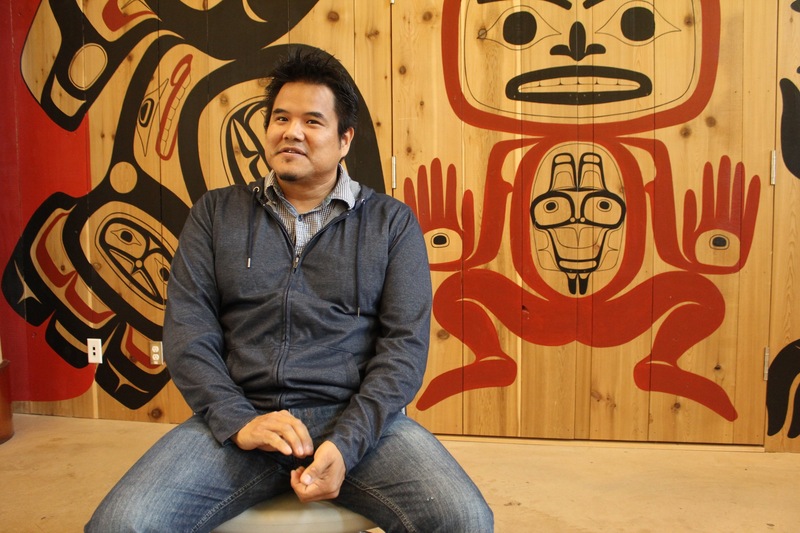 Dempsey’s art is grounded in the grammatical forms and stories of the Northwest coast. It is also an art that emerges from this place, from the shapes of the mountains, the winding curves of the rivers, the ovoid shapes of the pebbles by the streams, the towering cedars and the animals that populate this region. We spent a lot of time with Dempsey driving to the Nisga’a museum, going to the Kitselas Canyon, strolling across the dry river by Terrace and eating together on various occasions. 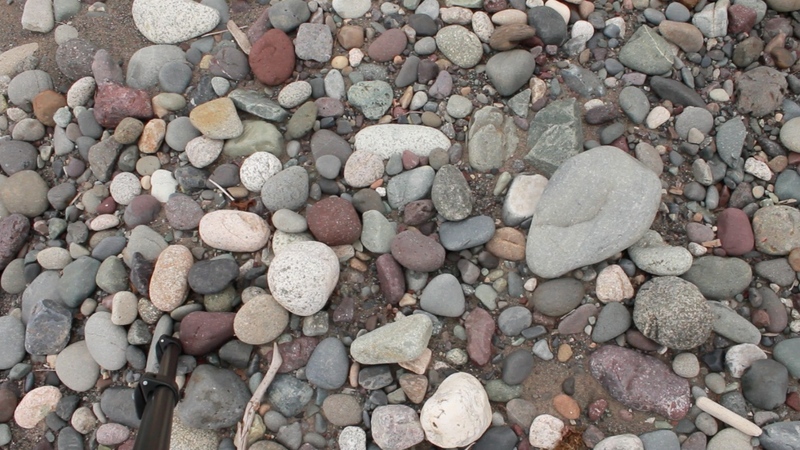 Often Dempsey would point out features of the landscape guiding our eyes to the shapes he saw in the mountains, or the swirl of the flowing river, or the roundness of a stone. These, he said, are where the grammar of Northwest coast art comes from, the ovoid shapes which we then began to see everywhere. 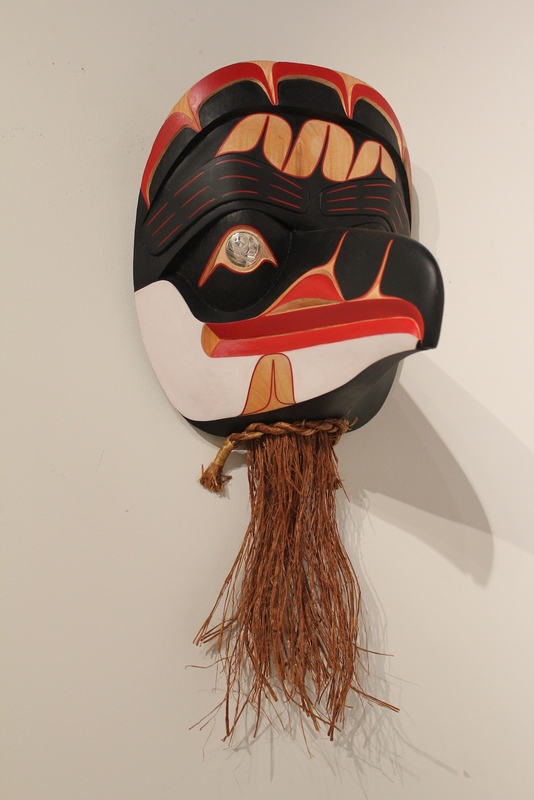 Grounded in this grammar of this region Dempsey, like a number of other accomplished artists from the Northwest coast, innovates and pushes the boundaries of this art form creating more intricate designs and forms, stretching his skills as a carver. 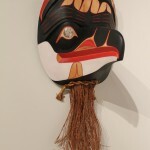 But Dempsey is also an artist between worlds, that of his Tahltan Nation for whom he continues to make ceremonial objects, totems and carvings that become part of a living cultural practice, and that of the international art market, where his objects come to acquire another set of meanings, values and functions. 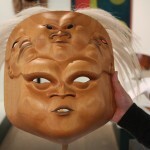 In Dempsey’s studio we saw the piece he is working on now, a beautiful face with smaller figures emerging from it. The sleeping unfinished sculpture is surrounded by hundreds of chisels, waiting to wake it up. Around the walls of the studios dozens of images serve as inspiration, many of these are of old pieces from the Northwest coast, but as many are of European art, especially Van Gogh and Modigliani. My time in Terrace was also a kind of healing from my falling out of love with art that happened in art college. I loved being here and talking to such committed artists who came from a place where art still felt very alive. I loved the generosity of these artists, and especially Dempsey, who shared with us their stories, inspiration, and aspiration for their communities and this art form. Art comes from place, Dempsey would say. And he was not just referring to the art of this region but also that of his favourite artist Van Gogh who drew his energy from the landscapes and people of southern Europe. Through teaching others at the School, Dempsey, Ken, Stan and Dean are opening up the path for a new generation to also connect to place and to its stories (and to culture, history and identity) through a particular way of seeing and making.